Raffle Tickets were sold on every day of the club's week long Members Exhibition, celebrating 80 years of Sidmouth Photographic Club. All entrants were able to nominate an exhibition print they would like to win if lucky enough to be drawn as the winner. Following the draw, made at the conclusion of he Exhibition, it was Julie Sorrell from Sidmouth whose ticket was the winner. 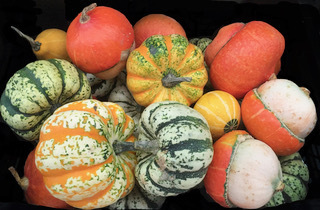 Julie had chosen the print named "Autumn Gourds" by the club's photographer Teresa Jacombs. Congratulations to Julie. The club would like to extend its sincere thanks to everyone who had purchased a raffle ticket.